Hello again, 36th Avenue readers! It’s Jill from Create.Craft.Love! I hope everyone is ready for Halloween. Can you believe the holidays are already here? It seems like only yesterday, we were preparing for Easter! When I think of the holidays, I think of the huge meal gatherings with family and friends. 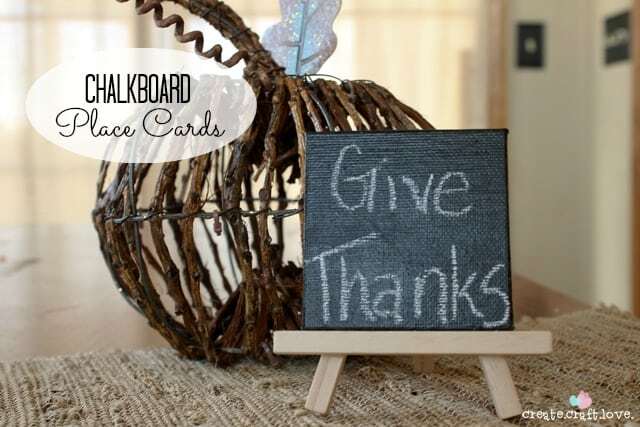 Accessorize your holiday table with these Easy Chalkboard Place Cards! 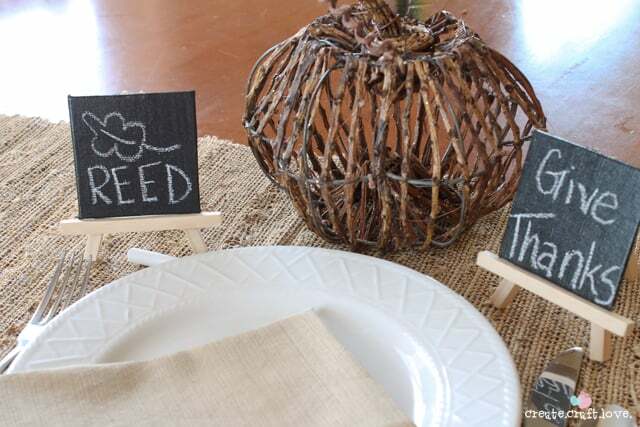 Wanna make your own Chalkboard Place Cards? When I saw these cute little mini easels at Michael’s, I knew I had to have them! I won’t even insult your intelligence with a step by step tutorial. 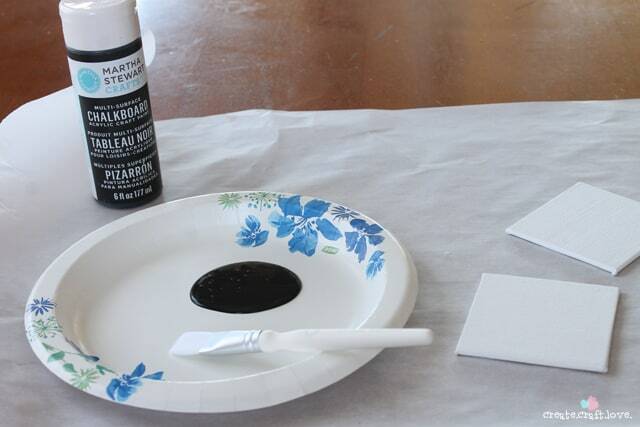 Simply paint the little square canvases with the chalkboard paint. I recommend 2 coats for best coverage and results. Follow the directions on the label for drying times. These little canvases will make great place cards at the grown up table or fun projects the littles at the kids’ table! You could also leave chalk at each person’s seat and ask everyone to write down what they are grateful/thankful for this year! It’s a great way to get everyone involved and keep the true meaning of the holidays – family, friends and togetherness. Challenge everyone to come up with something different! Fun conversation starters! 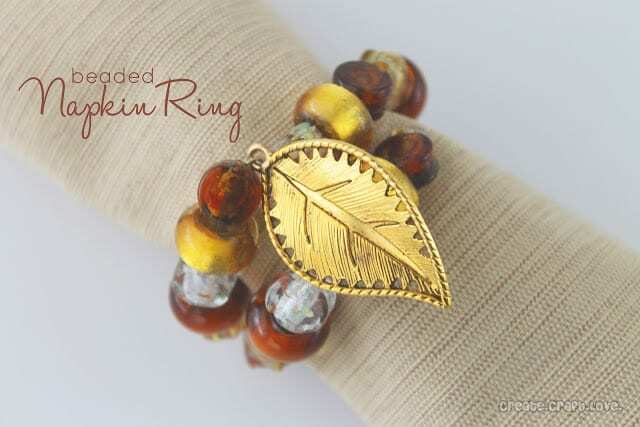 If you’re looking for more fall/holiday ideas, stop by Create.Craft.Love! 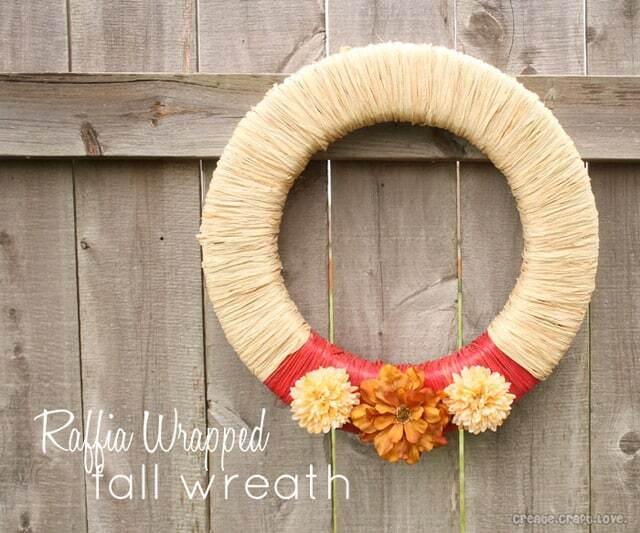 Create this pretty Raffia Wrapped Fall Wreath to greet your guests as they arrive for the Thanksgiving festivities! Or dazzle them with these classy and elegant Beaded Napkin Rings! I hope you’ll stop by and visit me at Create.Craft.Love! 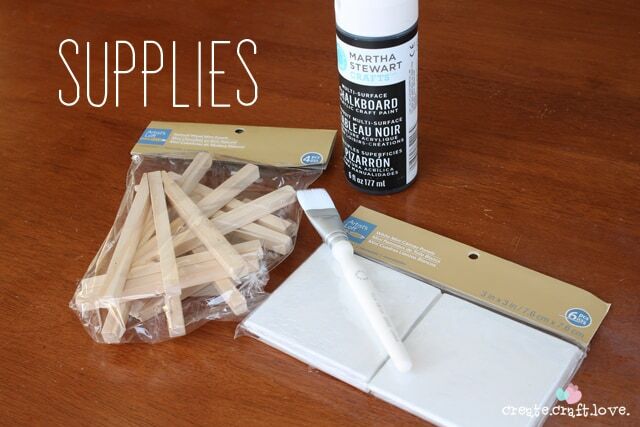 I offer craft/DIY tutorials for Pinterest addicts, craft junkies, DIY fanatics and busy mamas. Hi there! I’m Jill and I’m the crafty master-mind behind Create.Craft.Love. I am a full time nurse practitioner turned craft blogger extraordinaire! Create.Craft.Love. is a craft/DIY blog. It’s the creative outlet for my scientific mind and helps maintain my sanity. These are so clever and fun! Love them! Love this! So cute and easy! My kind of craft! SO cute – I love this Jill. I like Jen’s idea to get the kids involved too. Such a cute idea! I love the easel. My kids would think that’s so fun!